Jennifer ‘Jeni’ Fairman ’17 (Business of Art & Design M.P.S.) never thought she would be a business owner. After receiving her first Masters degree in medical and biological illustration from the Johns Hopkins University School of Medicine, Fairman envisioned her life post-grad, where working for an employer for a myriad of years would be the norm. Getting laid off one year into her first job was an unexpected hurdle she hadn’t anticipated so early in her career. Significant change was at hand, and Fairman was presented with two options–find another job in her field or step out on her own. With zero openings for a medical illustrator in the Boston area, Fairman took a leap of faith and started her own business. On April 4, Fairman’s hard work paid off when she was awarded $30k in funding during the 2018 UP/Start finals. Fairman credits Business of Art & Design Director Heather Bradbury and her UP/Start mentor, Ken Malone of Early Charm Ventures, as huge supporters of her and Illustr8science. Together, they’ve helped Fairman figure out how to hone in on the business idea she wanted to pursue and devise a plan for thinking about the value propositions that she provided to each of her market segments. By Alexander Gelfand, for the Johns Hopkins School of Public Health Magazine. The powerful genome-editing technology known as CRISPR-Cas made headlines this year—partly because many leading biologists called for a moratorium last March against using it to modify the genomes of human embryos, only to discover in April that Chinese scientists had already done just that. But CRISPR-Cas is more than a genetic engineering tool with profound ethical implications. In fact, the tool itself is a modified version of one of several types of naturally occurring bacterial immune systems that fight the viruses known as bacteriophages. The particular system that researchers have adapted for gene-editing is a relatively rare and simple one called CRISPR-Cas9. Scott Bailey, PhD, Associate Professor in the Department of Biochemistry and Molecular Biology, recently described the atomic structure of a far more common, and far more complicated, CRISPR-Cas system called CRISPR-Cascade—one with profound implications of its own. Bacteria use CRISPR-Cas systems to store the genetic signatures of phages that have previously infected them. These viral mugshots appear as stretches of DNA separated by short, repeated sequences. Together, the viral DNA and the repeats form arrays called clustered, regularly interspaced, short palindromic repeats, or CRISPRs. When a phage invades, CRISPR-Cas uses short strings of RNA to compare the phage’s DNA with its archive of viral signatures. If it finds a match, specialized CRISPR-associated (Cas) proteins are dispatched to disable the invader through various means. 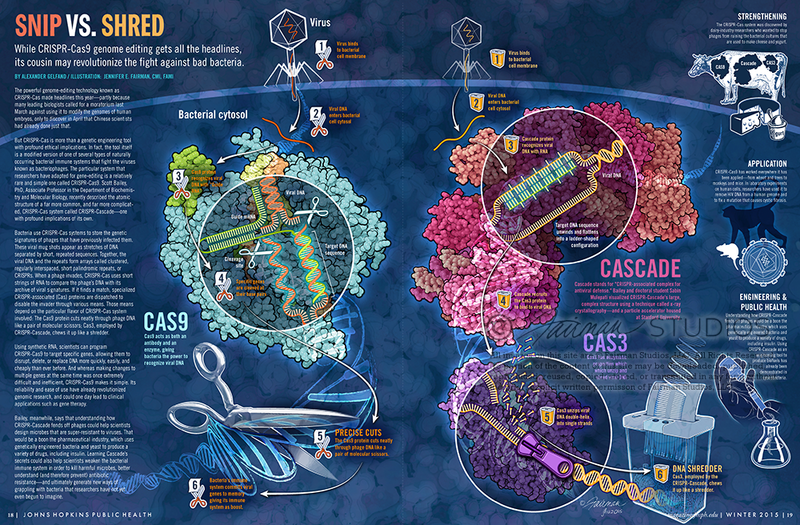 Those means depend on the particular flavor of CRISPR-Cas system involved: The Cas9 protein cuts neatly through phage DNA like a pair of molecular scissors; Cas3, employed by CRISPR-Cascade, chews it up like a shredder. Using synthetic RNA, scientists can program CRISPR-Cas9 to target specific genes, allowing them to disrupt, delete, or replace DNA more quickly, easily, and cheaply than ever before. And whereas making changes to multiple genes at the same time was once extremely difficult and inefficient, CRISPR-Cas9 makes it simple. Its reliability and ease of use have already revolutionized genomic research, and could one day lead to clinical applications such as gene therapy. Bailey, meanwhile, says that understanding how CRISPR-Cascade fends off phages could help scientists design microbes that are super-resistant to viruses. That would be a boon the pharmaceutical industry, which uses genetically engineered bacteria and yeast to produce a variety of drugs, including insulin. Learning Cascade’s secrets could also help scientists weaken the bacterial immune system in order to kill harmful microbes, better understand (and therefore prevent) antibiotic resistance—and ultimately generate new ways of grappling with bacteria that researchers have not yet even begun to imagine. The CRISPR-Cas system was discovered by dairy-industry researchers who wanted to stop phages from ruining the bacterial cultures that are used to make cheese and yogurt. CRISPR-Cas9 has worked everywhere it has been applied—from wheat and trees to monkeys and mice. In laboratory experiments on human cells, researchers have used it to remove HIV DNA from a human genome and to fix a mutation that causes cystic fibrosis. 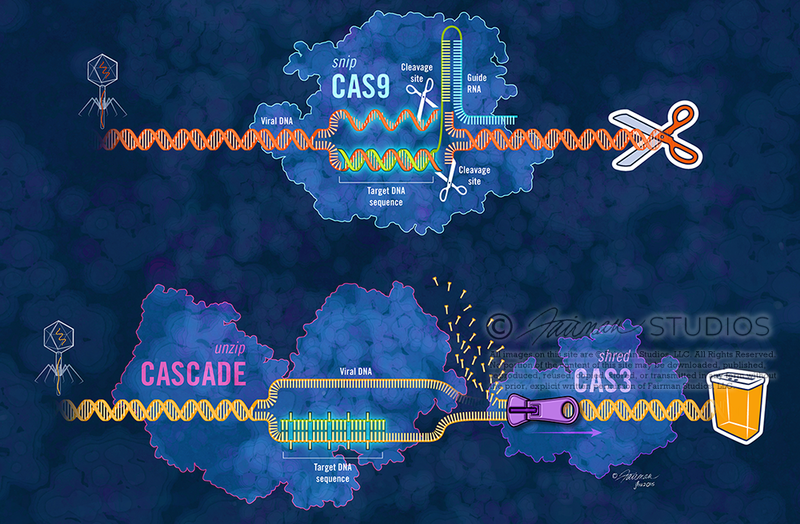 Cascade stands for “CRISPR-associated complex for antiviral defense.” Bailey and doctoral student Sabin Mulepati visualized CRISPR-Cascade’s large, complex structure using a technique called x-ray crystallography—and a particle accelerator housed at Stanford University. This illustration was created for a May 2015 AFP article reviewing the diagnosis and management of GAD and PD in the primary care setting. While GAD and PD can develop among children and adolescents, diagnosis and care for these younger populations requires special considerations beyond the scope of this review. Generalized anxiety disorder (GAD) and panic disorder (PD) are among the most common mental disorders in the United States. Frequently encountered by primary care physicians, both GAD and PD can negatively impact a patient’s quality of life and disrupt important activities of daily living. Evidence suggests that missed- and misdiagnosis of GAD and PD are high, with symptoms frequently ascribed to physical causes. The diagnosis of GAD and PD requires a broad differential and caution to identify confounding variables and co-morbid conditions. Screening and monitoring tools can be used to help make the diagnosis and monitor response to therapy. The GAD-7 and the Severity Measure for Panic Disorder are both available without cost. Successful outcomes may require a combination of treatment modalities tailored to the individual patient. Treatment frequently includes medications such as selective serotonin reuptake inhibitors (SSRIs) and/or psychotherapy, both of which are highly effective. Among psychotherapeutic treatments, cognitive behavioral therapy (CBT) has been studied widely and has an extensive evidence base. Benzodiazepines are effective in reducing symptoms of anxiety, but their use is limited by risk of abuse and side effect profiles. Physical activity can reduce symptoms for both GAD and PD. A number of complementary and alternative treatments are frequently used; however, evidence is limited for most. Several commonly used botanicals and supplements can potentiate serotonin syndrome when used in combination with antidepressants. Medication should be continued for 12 months to prevent relapse. Generalized anxiety disorder (GAD) and panic disorder (PD) are among the most common mental disorders in the United States (US). Frequently encountered by primary care physicians, the hallmark feature of GAD is excessive, out-of-control worries; for PD, it is recurrent and unexpected panic attacks. Both GAD and PD can negatively impact a patient’s quality of life and disrupt important activities of daily living. Missed- and misdiagnosis of GAD and PD are high, with symptoms frequently ascribed to physical causes. This year, the VT Live Auction will consist of a competitive treasure hunt! Teams will unlock clues by raising money before and during the auction, which will lead to Vesalius prints hidden all over The Plaza. The team that finds and correctly identifies the most prints wins bragging rights for life, and a prize for each team member! All team members will receive swag for participating (but winning is recommended). 1) Show up on Saturday evening at the Vesalius Trust Live Auction, and to raise money for the coolest Foundation in the biz. 2) Between now and Saturday, July 26th, raise as much money as you can using the Fairmanators Team CrowdRise web page that will be provided for you and your team. The more money you raise now, the bigger advantage your team will have during the treasure hunt! 3) Show up at The Plaza at the AMI meeting, Saturday, July 26th 7:15pm. Dress for action! Please wear a black t-shirt or top, comfy bottoms and shoes. We will have badge inserts for both Fairmanator Arena Crew Members and Field Crew Members. Each team will consist of as many individuals as you can recruit, but we’ll need at least 4. Each team will have two Crews; the Field Crew and the Arena Crew. The Arena Crew will solicit and report donations from the audience during the event – by any means necessary, and will also be responsible for relaying clues to the Field Crew. The Field Crew will be responsible for running around like maniacs (safety first, of course) solving clues and identifying the hidden Vesalius prints. When they discover a print by solving a clue, they will run the prints to the Arena Crew and get their next clue if the funds are there to buy one. Vesalius postcard prints will be hidden all over The Plaza, and clues to their location and content will be “earned” based on the amount raised by the Arena crew (and leading up to the event). The faster the Field Crew solves clues, the faster the Arena Crew needs to raise money to unlock more clues! The Team’s point totals and amount raised will be projected in real-time on a display at the end of the plaza for all to see! The team with the most points when the horn sounds wins bragging rights for life and a prize for each team member. Arena Crews can raise funds BY ANY MEANS NECESSARY. Act like maniacs,dress up in costumes, fly in your rich uncle to write a massive check, bribe people with food or free high-fives. Just remember you have to see these peopleon Sunday morning, and you probably work with some of them. Don’t do anything you’ll have to apologize for later. The Plaza will be dominated by med ills during the event, but it is a public space and there are restaurants and shops that will be open during the event. Field Crews, please be respectful of others. Also, feel free to wear running shoes,spandex, and neon leg warmers. 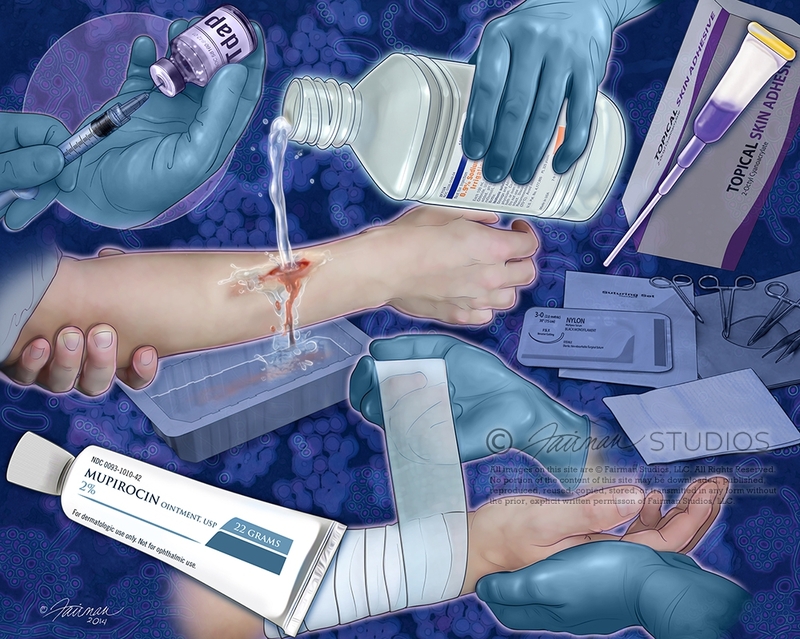 Talk to your friends and family and let them know what they are doing for medical illustration education. It’s like donating for somebody to run/walk for the cure, only they’re donating to their favorite medical illustrator to support medical illustration education and research activities, initiatives, and efforts. A Fairmanator Team CrowdRise on‐line donation site is set up at http://www.crowdrise.com/thefairmanators for easy payment and tracking. Details will be given to each team as the specifics are finalized in a separate document.This was a large part of the auction activity last year. It makes it very easy forpeople to donate and generated a large amount of competition between the teams. This year, the donations will have a DIRECT IMPACT on your team’s chance to win. Lets have fun, be safe, and raise some money for a great cause!